Paul’s three short letters to his sons in the faith, Timothy and Titus, might be compared to locker room speeches or a commanding officer trying to inspire his troops. In these three letters, Paul describes the type of work these young ministers ought to be doing. I noticed that there are at least three areas Paul focused on when he described the duty of these ministers. One of the recurring words, especially in Paul’s letters to Timothy, is the word “charge.” Paul had “charged” both of these young ministers to do a job. He had entrusted them with great responsibility. Timothy had been sent to work with the Ephesus church and Titus with various churches on the island of Crete. Like soldiers sent on a mission, these were their marching orders. The church continues to need men who will be devoted to teaching and reminding Christians how to live in a way that is consistent with faith in Jesus. I find it undeniably true that Timothy and Titus were entrusted with positions of leadership. Like a chain of command, Paul gave marching orders to these two men and they were expected to turn around and command, charge, and entrust various responsibilities to other Christians in their local communities. Timothy and Titus were given the job of delegating. They were not expected to do all the teaching, correcting, or ministry themselves. They were told to pass these responsibilities on to elders, deacons, and other “faithful” disciples of Jesus. There was a sort of delegated authority Paul had, a delegated authority these ministers had, and a delegated authority the elders, deacons, and others had when the baton was passed to them. Is everyone busy serving the Lord? Is the church being shepherded? Is the truth being taught? Are people loving and serving one another? If the answer to these questions is “yes,” then maybe we shouldn’t worry too much about the pecking order. If the answer is “no,” then someone needs to be charged with some responsibility. Pass the baton to a faithful person and encourage them to do what needs to be done. One of the most important parts of both Timothy and Titus’ roles was modeling good works. If Timothy and Titus taught the truth about Jesus, but their life did not reflect the Spirit’s sanctifying work, then their teaching would be in vain. This, of course, does not mean Timothy and Titus had to be perfect, but it does mean teaching and preaching always brings a level of scrutiny for which these men needed to be prepared. I love what Paul wrote to Timothy, “The aim of our charge is love that issues from a pure heart and a good conscience and a sincere faith.” The goal of everything Paul was doing was love. Love that issues from a pure heart. Paul knew that in order for his own ministry to be successful and for the ministries of his proteges to be successful, they had to all model love and work to bring about love in their life of the church. 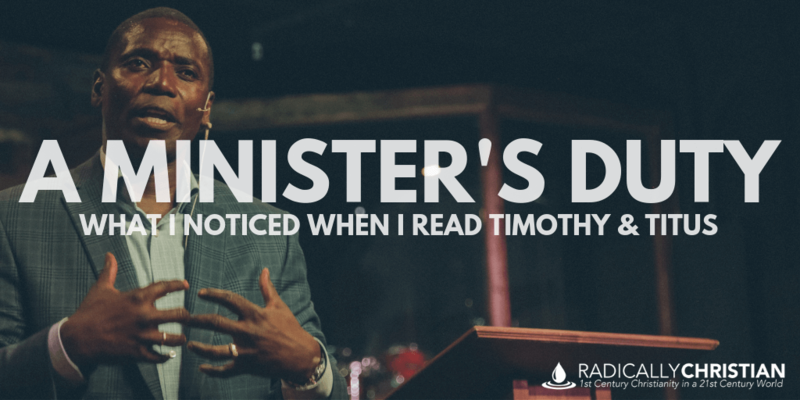 Whether we are talking about preaching ministers, involvement ministers, missionaries, or youth ministers, if a person has devoted their lives to the gospel, then there is much to learn from Paul’s letters to Timothy and Titus. They should primarily focus on teaching. They should find and dispel the myths and correct the misunderstandings we all have in our minds. They should explain to us, from the Scriptures, what lives look like that are consistent with the Good News of Jesus. They should be theologians, saturating their hearts and minds in Scripture so they can teach others. They should also lead and be empowered to lead. They should delegate responsibilities and equip others to minister alongside them in the kingdom. They should not be seen as hired hands, but as fellow soldiers in our battle against the schemes of the devil. And finally, they should set examples of love and good works. And of course, when they stumble, they should find grace and forgiveness, being allowed (and even expected) to confess sins and struggles (just like any other Christian). If we do not extend grace and forgiveness to our ministers, we will continue to have festering sin hidden below the surface; which will eventually be exposed and destroy lives, ministries, and the reputation of the church.